Haifa Diary: Where Do Tax Moneys Really Go? · World Vision is a respected global humanitarian aid organization operating in over 100 countries, with a budget of $2.6 billion (USD) and 46,000 employees. · World Vision is one of the largest aid organizations in the world and operates in collaboration with the UN. · World Vision has operated in Israel, the West Bank (Judea and Samaria) and the Gaza Strip since 1975. · 60% of World Vision’s annual budget for the Gaza Strip was diverted by Hamas operative Mohammed El-Halabi to Hamas (approximately $7.2 million/year). · 40% of the funds designated for civilian projects ($1.5 million/year) were given in cash to Hamas combat units. · Monies designated for the needy in Gaza ($4 million/year) were diverted to Hamas for the construction of terror tunnels and the purchase of weapons. · A Hamas military base (code-named “Palestine”) was built using the aid organization’s money. $80,000 received from the United Kingdom went to construction costs of the base, paid in cash, while salaries were paid to terrorists who worked in the construction of the base. · Hamas received building materials from the aid organization that it used for its military facilities and terror tunnels, including iron rods, fences, greenhouse covers [used for camouflage purposes] and pipes. · During the Morsi regime in Egypt, El-Halabi diverted tens of thousands of dollars of the aid organization’s funds to purchase weapons in the Sinai, for Hamas. · 2,500 food packages worth $100 each went to terrorists [total value $250,000]. 3,300 packages of cleaning supplies and personal hygiene products worth $80 each were also given to Hamas units [total value $264,000]. · Some of the money raised to support injured children in Gaza was diverted to the families of Hamas terrorists, by fraudulently listing their children as wounded. · Money designated for psychological support, education and health in Gaza ($2 million/year) was used to pay the families of Hamas terrorists. · Part of the aid organization’s donations was transferred in cash and recorded fraudulently as aid to needy children. 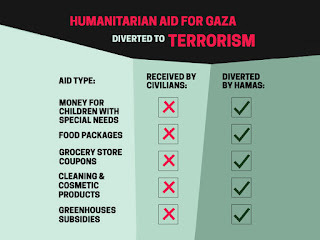 · Monies were paid out as salaries to Hamas terrorists and activists, who were registered as employees of the aid organization when in fact they never worked for World Vision. · Costs for legitimate infrastructure projects were inflated, with the difference going to Hamas. · Straw companies - two farmers' associations and a fake charity for the benefit of the injured - were established with false registers to launder money. · Unemployment payments were diverted to Hamas terrorists. El-Halabi arranged for one-third of the allowances World Vision transfers to Gaza for the unemployed to go to members of the Izz ad-Din al-Qassam Brigades. The terrorists also received a larger allowance (NIS 1500 instead of NIS 1250, or $300). · Using lists of fictitious beneficiaries, $2 million/year designated as aid for farmers was diverted to Hamas activists. El-Halabi reported a larger sum than that actually transferred to the farmers to World Vision. The difference was diverted to Hamas. · Project costs were inflated. For example, World Vision invests in many agricultural projects in northern Gaza, one of which involves the construction of 500 greenhouses and the preparation of land (495 acres) for agriculture. El-Halabi reported to the charity that the cost was $1,000 per quarter acre, while the real cost was $700. The difference – $300 per quarter acre - was transferred to Hamas.